When comparing payroll processing companies for small business, three of the best software options are ADP vs Paychex vs Gusto. All provide software as a service (SaaS) online payroll—including labor law and tax compliance. ADP and Paychex have more reporting and customization options and are priced significantly higher than Gusto. We recommend Gusto as the best payroll provider for small businesses with under 100 employees because they deliver services comparable to big-name competitors at a significantly lower price. They’ll manage payroll taxes on your behalf, issue payments via direct deposit, generate year-end W-2s and 1099s, help you find workers’ compensation insurance, provide employee benefits, and more. Get your first payroll free. ADP is a great payroll option for businesses that grow past 100 employees, those who have used ADP in the past, or businesses that want to customize their payroll process, reporting, and interfaces. With over 60 years of payroll expertise, ADP has experience building custom tools and features to solve the most complex employee payroll setup. Contact ADP for a quote. Businesses that seek large employer payroll experience and excellent customer service may prefer Paychex over ADP. Both ADP and Paychex are two of the most well-known payroll providers in the U.S.; when looking at ADP versus Paychex, there is little difference between them. They’re both built to support big employers with levels of complexity and customization options many small businesses don’t need. Request a demo here. *Pricing estimates are for 10 employees with bi-weekly payroll. However, Gusto charges monthly based on the number of active employees you have, whereas ADP and Paychex price by payroll run. Therefore, your actual price with ADP and Paychex may change from month to month. For instance, if you run payroll weekly with ADP, your payroll costs will be double what’s shown above versus with Gusto, there would be no difference in price. Quiz: Is Gusto, ADP or Paychex Best for You? Do you want to be able to issue W2s and 1099s yourself? Yes, I want this included. No, I can get this elsewhere. Do you want to add employee benefits yourself? Yes, I want an all-in-one platform. When looking at payroll providers for small business, we wanted to ensure the software was easy to use for a typical business owner, provided proper calculations and deductions for overtime and taxes, offered payroll for both W-2 and 1099 workers, and had the option to add employee benefits. What makes Gusto our top recommendation in our best payroll software reviews is that they do all these things without additional costs, as compared to ADP and Paychex, which charge extra for timekeeping, garnishments, posters, and extra payroll runs. In addition, Gusto’s pricing is transparent and there are no setup fees, whereas with ADP and Paychex, it’s up to the sales rep. Try a free 30-day trial. Comparing prices between Gusto, ADP, and Paychex can be a little tricky, as neither ADP nor Paychex post pricing on their websites. They may or may not offer discounts once you get on the phone with a sales rep. For example, when we contacted them for quotes, ADP’s sales team offered a 20% discount and waived the setup fee, while Paychex’ sales rep offered a 40% discount and was willing to waive the setup fee as well. Discounts are usually time-limited though, and there’s no guarantee that they’ll offer one when you call. The prices shown below reflect a business with 10 employees running bi-weekly payroll. Note that Gusto does not offer discounts and yet beats both of them on price. In addition, with Gusto, your first month is always free. 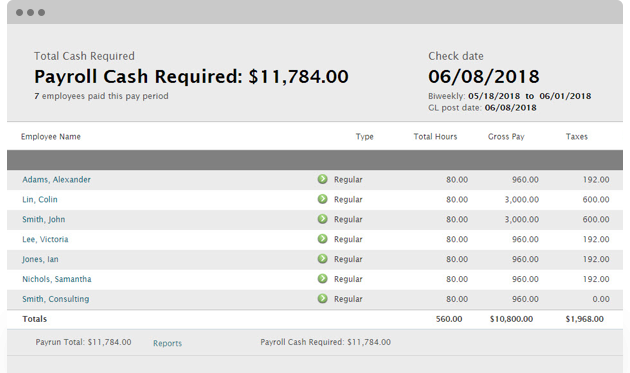 In addition, ADP and Paychex charge per pay period, while Gusto charges per month regardless of your payroll schedule. This is important if you pay people more than twice a month because you will pay extra each separate payroll run, such as a year-end bonus run, or weekly payroll if you use ADP or Paychex. With Gusto, your price does not go up if you run payroll more often, such as weekly. Gusto’s pricing is simple: it’s $39 per month plus $6 per employee. For ten employees, this comes out to $99 per month. There are no additional fees for setup or for year-end W-2 or 1099 processing as there are with ADP and Paychex. With Gusto, your monthly rates are fixed regardless of how many payroll cycles you run and your first month is free. Unlike ADP and Paychex, year-end tax documents are included at no extra charge. For 10 employees and running bi-weekly payroll, we were initially quoted $101.65 per pay period plus a one-time setup fee of $25. ADP then offered to discount their rate to $81.32 and waived the setup fee. Because payroll is run bi-weekly, this comes out to about $162.64 per month (or $81.32 x 2). ADP also charges extra ($45 plus $5.75 per employee, or $102.50 for 10 employees) to process W-2s and 1099s at year-end. Tax filings, garnishments, labor law posters, and other add-ons cost extra, which almost guarantees your actual price will be higher. Paychex quoted $77 per pay period plus a $200 setup fee, although they offered to waive the setup fee. This makes Paychex the most expensive service, despite the fact that the $77 per pay period is a significant discount from their regular rate (it was a time-sensitive offer). Like ADP, Paychex also charges an additional fee to process year-end W-2s and 1099s. This charge was $60 plus $6.25 per employee (or $122.50 for 10 employees). Gusto comes out to a fraction of the price with a fixed rate per month instead of charging per payroll run. It’s two-thirds the price of Paychex and almost half as much as ADP. Plus, they don’t lock you into an annual contract, charge setup fees, or try to upsell you on time and attendance software. And unlike ADP and Paychex, Gusto provides a free 30-day trial. Get your first payroll free. When it comes to payroll providers, Gusto, ADP, and Paychex payroll software programs provide similar services: they all manage payroll processing and payroll taxes. They can onboard new hires, set up employee benefits, and pay employees via direct deposit. In general, all three have similar features. However, ADP and Paychex offer a labor law compliance service (they’ll send you mandatory federal and state posters) for an upcharge, whereas Gusto provides links where you can download posters yourself at no cost. In addition, ADP and Paychex have a Professional Employer Organization (PEO) option. Gusto doesn’t. Additionally, all three companies can help you set up employee benefits, such as retirement funds or health insurance. However, with Gusto serving as an insurance broker in 24 states, you can manage employee benefits within the same software—from open enrollment to checking HSA and FSA balances. Employees can access their benefits information online with the employee benefits dashboard. Payroll processing is usually every HR person’s most disliked responsibility, but Gusto makes it easy and relatively painless. In fact, Gusto offers all the features listed above and its payroll runs in just minutes. In addition, you can make adjustments (such as adding a bonus or processing retroactive pay) on the fly. In addition, Gusto doesn’t charge you to enroll in a poster compliance program. Instead, they provide downloadable posters via online links to government websites, where they can be obtained for free. Gusto also offers free W-2 and 1099 processing. Gusto provides direct deposit and pay cards, but does not offer to send your employees physical checks because you can print them yourself from the software. If you have employees with wage garnishments or other mandated deductions like child support, Gusto requires you to process these manually, whereas ADP and Paychex manage the deductions and payments for you. But, it’s an extra charge. Gusto provides an employee self-service portal that does more than providing employees with pay stubs. It is a full employee document vault that includes e-signature, downloadable policies, forms, and an employee handbook. Employees can also make their own changes to benefits, 401(k) elections, and tax withholdings. With Gusto, their pricing includes providing year-end tax documents for your employees and the IRS, regardless of how many U.S. states your employees work in. ADP and Paychex will do this as well, but for an additional fee that costs extra if you have employees working in more than one state. That’s because they charge per state for each state they have to file taxes in. Because Gusto is a licensed benefits insurance broker in nearly half of the U.S. states, they can help you find affordable insurance, from workers’ comp to health care for your employees. Even better, your employees can enroll, view plan documents, and make benefits changes online. Life insurance, 401(k), and even commuter benefits are available to your staff with Gusto. Gusto’s reporting options are limited to the basic reports that a small business may need. They can be run with date ranges and other variables with output to a PDF or a CSV file for further analysis. However, Gusto doesn’t have as many standard reports as Paychex and ADP have. Along with the standard payroll features mentioned above, ADP offers check printing and poster compliance. 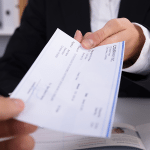 If you prefer to send employees physical paychecks rather than direct deposit, ADP can print, sign, and mail paychecks on your behalf for an additional fee. They’ll also send you any workplace posters you need to stay compliant with labor laws if you order their poster compliance package. It’s not that ADP is missing any functionality as much as that they’re a huge company. Their customer service sometimes takes time, as do changes. And they charge extra for many of their services. ADP processes wage garnishments and other withholdings automatically, which is a nice perk. The biggest downside is that they charge for each and every payroll run, which means anytime you need to make a correction, you’ll be charged for it. ADP offers your employees a self-service portal called MyADP. Employees can view pay stubs, W-2s, update their direct deposit account, and make many changes online themselves, saving you time. ADP will deduct federal, state, and local taxes and provide payments to the various state and federal agencies. However, ADP charges $102.50 for issuing W-2 and 1099 forms, while Gusto provides them for free. Similar to Gusto, ADP has its own insurance company, ADP Insurance AGency (ADPIA), but it doesn’t offer insurance in as many states as Gusto. 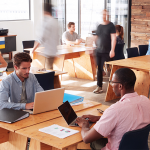 Both ADP and Gusto can manage benefits through the same system as they run payroll, making it easy for you and your employees to keep track of benefits enrollments, changes, and costs. The insurance brokerage is one big difference between ADP versus Paychex. Over 60 years, ADP has developed oodles of reports covering payroll, taxes, employee benefits, and garnishment payments. They also have a custom reporting option that makes them valuable for larger firms that want to do intense data analytics in Excel or export data to other software. Like ADP, Paychex is a large company and not as responsive as Gusto to changes and requests for assistance. They charge extra for services Gusto provides for free, like issuing 1099s; both ADP and Paychex are more than twice the cost of Gusto for similar services. For example, Paychex processes wage garnishments and other withholdings on your behalf for an extra charge. Running payroll with Paychex is nearly as easy as with Gusto. You start your payroll, input your data, and then verify your entries before running and submitting your payroll process. Like Gusto, you can manually update time worked or add on Paychex’ time and labor solution to streamline timekeeping data entry each pay period. Of course, that costs extra. Like ADP, Paychex offers check printing for an additional fee as well as poster compliance. Paychex provides a mobile app for employee self-service, whereas with Gusto, it’s a mobile-optimized website. But with Paychex, employees won’t be able to see benefits plans and other features—it’s for viewing pay stubs and tax forms—convenient, but not all-inclusive. Similar to ADP, Paychex charges a fee for W-2 and 1099 processing. In our 10-person example, it would add $122.50 per year extra. Paychex does do federal, state, and local taxes for you, but it is the most expensive of the services we reviewed—both for W-2 and 1099 processing as well as the total cost overall. Paychex, like most payroll software providers, can manage benefits deductions. And they can help you find a benefits provider. But they’re not a licensed insurance broker like Gusto and ADP are, so you’ll be dealing with a benefits interface and need to ensure enrollments are up to date and providers are paid. You’ll also need to manage open enrollment and employee questions yourself. Paychex is more similar to ADP in terms of its reporting options. They offer 100 on-demand reports that allow you to choose parameters and customize data exports. We can’t emphasize enough how much easier Gusto is to set up and use than ADP or Paychex. First, you can create your own account and walk through it easily following a step-by-step process. You can also use the online chat function to ask questions as you go. ADP and Paychex have set up processes that require you to work with multiple team members to set up your system. That can take days or even weeks due to the complexity of their system options. After you create your account with Gusto, you’ll receive a welcome email and a message inviting you to discuss your setup with them. Our experience with ADP and Paychex was quite different—representatives would call every few hours, then when we finally spoke with them, they proceeded to try to upsell us on other services. In comparison, you actually have to talk to a sales rep from ADP to set up your account with them. We suspect this is an opportunity to try to upsell product features, but it could also be that their technology hasn’t caught up to Gusto’s system and ability to process your company’s information online through the web service. Once you access the system, you may find it less intuitive to use as well. Setting up payroll with Paychex, like ADP, takes more time due to their complex software. It involves sending files and data to a rep, waiting for them to create your account, and then double-checking the information. Again, this can take days. Once you’re in the system, it’s also more complex to use than Gusto. ADP and Paychex offer 24/7 phone and email support while Gusto only offers phone and email support from 8 a.m. to 5 p.m. Pacific Time, Monday to Friday. However, users tend to speak much more highly of Gusto’s customer service than ADP’s or Paychex’. In addition, Gusto also offers live chat support, whereas ADP doesn’t. Gusto has a strong customer support team and a newer online software that’s very easy to use. Gusto provides phone, online chat, and email support from 8 a.m. to 5 p.m. Pacific Time, Monday to Friday. Gusto, ADP, and Paychex have similar user ratings, with Gusto’s ratings slightly higher, especially from small business owners. ADP provides 24/7 phone and email support but appears to have more issues with customer service than their competitors. They also have no online chat. However, this could be due to ADP being the largest of the three services we reviewed. Users are more likely to complain about poor service than rave about positive service, so it could be the case that more users simply means more complaints. ADP also has no online chat. Paychex provides phone and email support 24/7 and live chat from 8 a.m. to 8 p.m. Eastern Time. Paychex users tended to rate its customer service highly. However, like ADP, Paychex received a fair number of complaints on third-party online review websites. In general, our small business users gave Gusto more and better online reviews. In fact, five times as many small business reviewers gave feedback on Gusto than the other top two payroll processing companies. We think that’s because Gusto is simply easier to set up and use than payroll software that’s been around for decades. Gusto has generally excellent reviews on third-party websites, including ours. Despite their shorter support hours, users were very positive about their customer support team. Most loved the clear instructions from Gusto and the option of live chat or call support during the setup process. 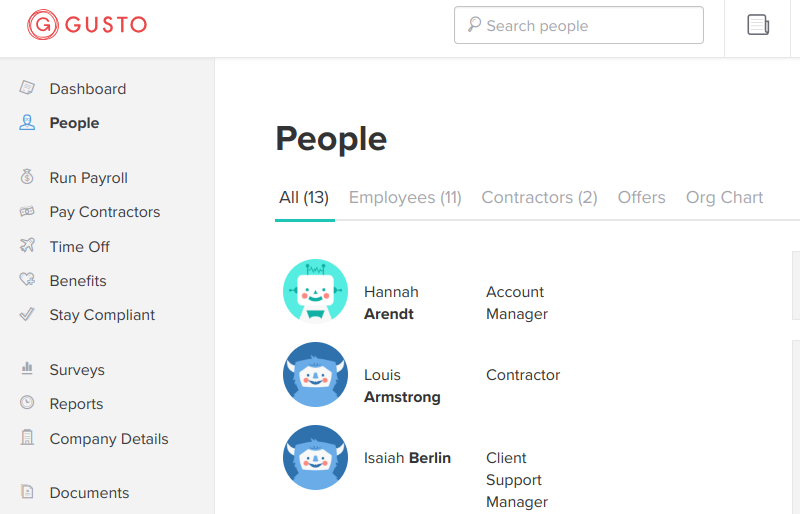 The only complaint we came across was about the onboarding process, which employees are asked to handle themselves on the Gusto website—some new hires didn’t love that. Check out our Gusto review where you can see real user comments. On third-party review sites, many ADP users note long wait times on the phone, billing issues, setup issues, and other problems with their account. Users generally like the payroll functions and tax compliance aspects of an established company like ADP, although some feel the user interface is antiquated. Others complained about how long it takes to get set up, and that they often have to wait to get issues resolved. For more information, take a look at our ADP user review. Despite offering clients dedicated customer service reps, several users complained about disorganization, such as having to speak with different departments for help for each module (benefits, payroll, HR, and so on.) or just being forwarded from employee to employee. And users don’t like the upcharges. Some noted billing issues, tax issues, or website issues, with multiple users finding the interface to be slow and dated. For more insight, check out our Paychex user review. Gusto, ADP, and Paychex offer a variety of payroll and HR services. At one end of the spectrum, they act as an outsourced HR department—managing all of your payroll, benefits, onboarding, and providing an HR advisor to contact. At the other end, they give you online software to run payroll yourself. Cost: It’s usually much cheaper to use software (outsourcing HR can cost as much as 3% to 6% of your total payroll, such as with a PEO, whereas payroll software costs $100 to $300 a month, depending on company size). Accuracy: Payroll software has advanced to a point where payroll compliance is taken care of for you. For example, new hire reports are automatically filed electronically with the state, and your payroll taxes are calculated and paid using tax tables. Errors: Tax penalties from payroll errors and misfilings alone cost nearly $5 billion a year due to errors like misclassifying employees or failing to pay overtime. Payroll software reduces the likelihood of these errors by automating calculations for you in compliance with federal, state, and local labor laws. For these reasons, we focused on payroll software in this article instead of payroll services. While Gusto, ADP, and Paychex do have more comprehensive HR services available, their payroll software packages are what most small businesses will need and use. These days, cloud-based software can do much more than process payroll. In addition, there are outsourced payroll software and services that cater to small business, providing HR compliance, payroll processing, and even co-employment. HR software, often referred to as a Human Resource Information System (HRIS), is an option that provides much more than payroll processing. It’s a database of employee information that often includes payroll, and may add employee information such as performance reviews or talent profiles. Vendors like Zenefits come to mind. Read here to learn more about HR software. A payroll service is a provider that you outsource your payroll processing to. They’ll manage all setup, tax filings, and accounting interfaces. Some even let you call in your data over the phone. Check out our complete article on the best payroll services for small business. A PEO partners with you to manage most of the workplace compliance needs of your business, including labor law and payroll. They typically have purchasing power that can save you on workers’ compensation costs while offering reduced benefits insurance rates. ADP TotalSource is a solid choice if you want your PEO to be a payroll expert as well. Gusto offers almost as many features as ADP and Paychex but at a fraction of the price. For more options, check out our ADP payroll competitors article, or look at our best payroll software reviews. Gusto continues to come out on top because it’s easier to use, less expensive, and has better user reviews—both for the payroll software itself and their customer support. While Gusto does have a few drawbacks, such as no 24/7 support, no paycheck mailing service, and no poster compliance, its benefits far outweigh these inconveniences. Given all you get for the price, including an HR portal and online document storage with e-signature, Gusto remains our top recommendation for businesses with under 100 employees. Get your free 30-day trial below. I switched after two payrolls on Gusto to ADP. Gusto is great if you have 10 or less employees. We have over 50 and Gusto should have not taken us on as a client as they can not handle this. They do not have GL capability. Which is huge. What payroll provider now a days can not produce a GL for most accounting systems. We had to manually do this when on GUSTO our bookkeepers wanted to walk out when they found this out. To be fair they can produce a GL as long as you use QuickBooks, again this is fine if you are a small coffee shop. In the end we found way to many needed features missing for us. ADP is a bit more expensive but they also have been doing it a long time and have all the features plus. Thanks for sharing your feedback. Yes, Gusto has GL interfaces, but doesn’t do GL accounting as it’s designed for payroll, benefits and HR. What makes it stand out for small businesses is it’s full-service offerings, including allowing the smallest of businesses to offer health benefits to their employees. We’d love to have you share your insights on our reviews pages. There are better alternatives out there. WorXsiteHR provides all the services of an ADP, Paychex and Gusto at NO COST. Plus, they are able to write the health, workers comp and general liability insurance in-house. If an employer wants to save money, it doesn’t get any cheaper than free. I would be weary of any company that offers such a substantial service for free. Especially considering you’re providing them sensitive information, like SSNs and bank account numbers. I was not able to find any user reviews for WorXsiteHR, so I can’t confirm whether or not its a legitimate service. Thanks for some very useful information! Would anyone be able to tell me if any of these 3 services offer “blind” payroll entry? In other words, can I set up my assistant to enter payroll hours for our weekly payroll without being able to see rates of pay, etc.? That’s a great question and one we’ll have to research before our next update. What you might consider is not giving your assistant access to payroll itself, but instead using a timekeeping system that uploads the data to your payroll system. She could then manage the time keeping aspect, — input or verify hours and do the upload, but not process the payroll run. You might consider Gusto because they partner with Homebase for time keeping (at no additional cost), and cost only $39 per month plus $6 per month per employee. More details are available in the articles below, and I’ve attached a link to a pre-recorded webinar that may help you choose. I would encourage anyone to connect with me prior to partnering with ADP. Although we can’t post your contact information here, since comments are made through Facebook, readers may be able to look you up there. We currently have Paychex and there services seem to keep getting more and more expensive, when we have issues (which is often) we have called several people and our frustration level is growing. So we are looking for a similar service and it looks like Gusto is going to be the service for us at a fraction of the cost!! I’m a manager at ADP, I know I’m a little late in responding but i just stumbled upon this article. I can definitely have a conversation with you about your business needs. This article is very biased toward Gusto, there are so many other things about ADP that AREN’T listed here. ADP is known for investing millions in technology for the best experience for our clients. I’d love to show you our technology and our platform. We’ve saved your email contact info for the next time we update this article as we want to ensure we’re reflecting each software option correctly. You may also want to check out our reviews section on the site or claim ADP reviews so that you can provide information to our small business owners looking for software. Here’s a link to our payroll software reviews. Overall, you’ll see that our small business readers and online reviewers rate Gusto higher than ADP, Paychex, Intuit (QuickBooks) and Square. You might consider attending our free “Introduction to Small Business payroll” webinar co-hosted by Fit Small Business and Gusto. By registering, you’ll get a free 30 day trial. Thanks for posting your feedback!